New feature #1: Configure which apps to use to view certain file types, and how to treat them in the preview (e.g., as text). Imagine you regularly work with server log files and although the .log files open with Console.app on macOS and you want to keep it that way, you’d rather open those server log files with BBEdit. 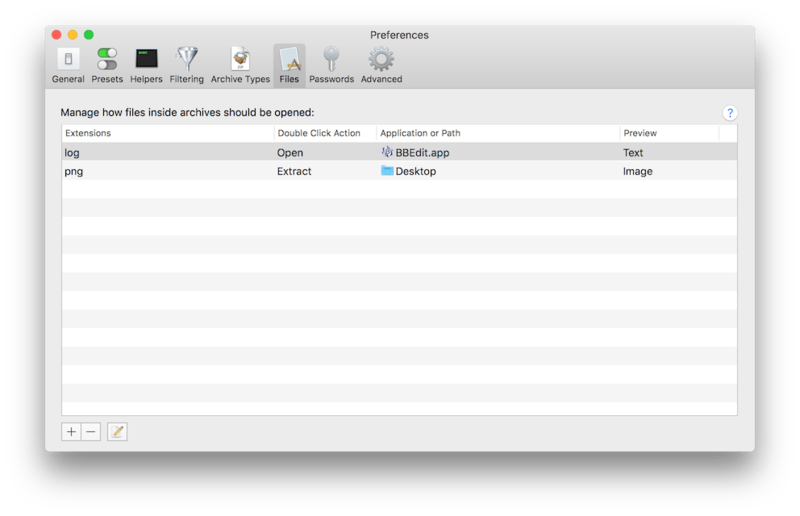 A double click in the archive window always fired up Console.app, so you had to use the “Open with…” menu. Meh. BetterZip 4.1 now lets you configure to open them in your favorite editor instead. Yay! Alternatively, have BetterZip automatically extract files of a certain kind to a predefined folder when double clicking. New feature #2: I completely rewrote the password manager. Passwords are now stored AES-256 encrypted in the preferences file instead of the macOS keychain, keeping your passwords safe, but making it easier to completely copy your BetterZip setup from one Mac to another or using a common set of passwords in a multi-user environment. The transformation will be done automatically. Additionally, the passwords can now be locked and unlocked with the master password for increased security. 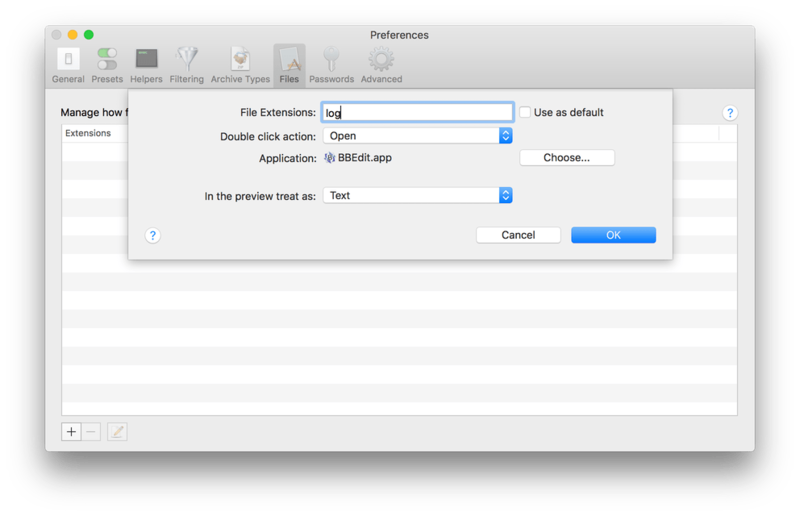 Configure when BetterZip should lock your passwords in the preferences window. The password manager’s “Import” function became “Edit Passwords as Text”, which allows you to edit all passwords as text and copy them to the clipboard for external save keeping, e.g., in a secure note in your favorite password manager. There are many more bug fixes and enhancements in the new version that you can find in the release notes. One of these concerns the BetterZip Quick Look Generator: The QL system on macOS has a size limitation (120MB — ridiculous, I know) and when a generator uses more memory than allowed, it is simply killed off, similar to apps on iOS. When you tried to preview an archive with a huge number of files, it always failed. I have now added an “item count” field and a limit of 10,000 files (which is approximately where the system’s memory limit kicks in). If an archive has more files than that, only the first 10,000 will be listed. You can still preview all the files in the archive with BetterZip which is just as quick. One last thing: I have converted the BetterZip help into an online readable format and placed it in the new MacItBetter Library together with a number of articles, tips and tricks. Now that I have the place and infrastructure for it, I’ll regularly add new content there.